I exited the elevator on the cardiology unit and asked the head nurse if they had any patients with diabetes they would like me to see? She said Richard was admitted with congestive heart failure (CHF), but also was newly diagnosed with diabetes. I knocked on his door and entered his room. He was a stout 70 year old white haired man sitting up in bed who appeared weak and weary. I sat down in the chair next to him and began to teach him about his diabetes and how he could control it with diet, exercise, and an oral medication which his doctor had prescribed for him. He paid good attention and asked some very specific scientific questions. I asked, “Richard, what kind of work did you do before you retired?” He replied, “I was a physics professor at the University for 35 years.” I replied, “That was my Alma mater where I graduated from the School of Nursing! I never took any physics classes since I was so busy with my nursing courses. I really loved attending the Bible class on campus and meeting students from all over the world.” We continued our conversation which I concluded a few minutes later. As I was leaving, I asked Richard if I could give him something to read with some Bible verses that told how he could have a personal relationship with Jesus Christ? He answered, “Well, Pam, I have to tell you that I’m an atheist. I don’t believe God even exists. But I will take it and read it.” He put the gospel tract on his bedside table. Richard was discharged home the next morning, so I didn’t have an opportunity to visit him again. I listened in dumbfounded silence, hardly able to believe my ears! Then I told Richard how thrilled I was that he now knew Jesus Christ as his own Savior. I asked him a few more questions, and it appeared that he truly understood the gospel and had done business with God. He certainly sounded like a totally different man. I asked him if I could visit him at home to meet his wife and study the Bible further with him? He said he would absolutely love for me to visit him! The next evening I entered his spacious lovely home and met his wife. We all sat down at the kitchen table and began to read Bible verses together. It was such a delightful time of fellowship as Richard asked me many questions as a newborn babe in Christ. I asked if one of the elders from church could come and teach him the Bible? He said that would be marvelous! 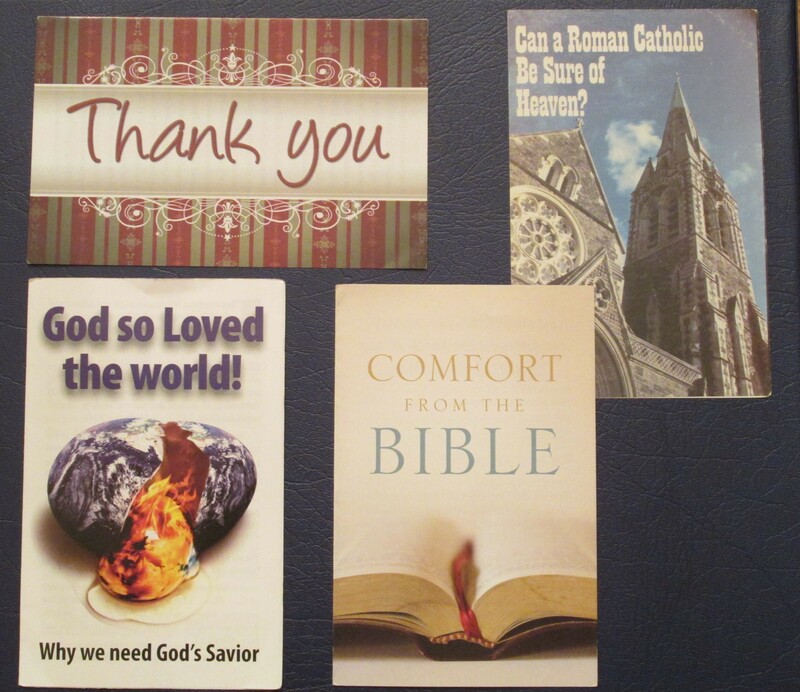 Some of my favorite gospel tracts to give to people. I always carry gospel tracts in my purse so I’m ready to hand them out at restaurants, the airport, to store clerks, etc. The following are some good websites where you can obtain gospel tracts. Thank you so much Pam for sharing! It’s so hard now to share the gospel with patients – you’re only allowed to share your “religious beliefs” if a patient were to ask you. I remember my first days of Enrollment in the Hospital and HR was clear that proselitizing was grounds for dismissal. Such a sad things when as a nurse you have opportunity to see people at the worst moments of their lives and cannot offer such sweet Hope without them asking. So I started praying that God would give some curiosity to my patients so that I could be free to share the Gospel. And God did answer, not only with patients but co-workers too! Thanks for sharing this, Jenni! It is sad that we no longer have the freedom of speech that I had when I started my nursing career. I am no longer permitted to give tracts to my patients either. But as you have learned, nothing is too hard for the Lord!